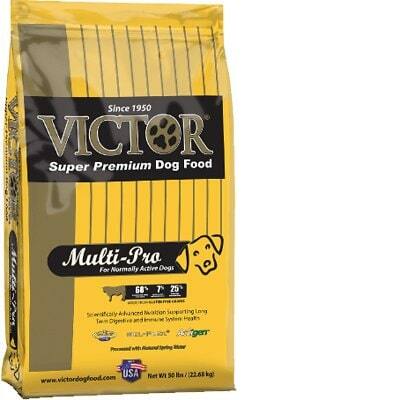 Victor Multi-Pro is a great quality dog food at a low price. This product has no controversial ingredients and does not use any artificial preservatives, colors or flavors, excellent. However, it has a very high amount of carbs, compared to its protein and fat content. The high carbs are a concern, but the meat and fat quality in the food is excellent. Victor has a below-average number of recalls And was extremely transparent when answering our questions. Watchdog Labs recommends this product. The food has high carbs and low protein and fats, making it less nutritionally balanced compared to other dog foods we evaluated. Carbohydrates are cheap so they keep the food’s cost low and they are nutritionally useful to dogs in the right amounts. However, very high amounts of carbs can reduce the much-needed meat-based protein and fat content. Grain Sorghum, Beef Meal, Chicken Fat (preserved with mixed Tocopherols), Pork Meal, Chicken Meal, Dehydrated Alfalfa Meal, Flax Seed (source of Omega 3 Fatty Acid), Feeding Oat Meal, Yeast Culture, Natural Chicken Flavor, Potassium Chloride, Dried Kelp, Salt, Montmorillonite, Tomato Pomace (source of Lycopene), Dried Carrot, Choline Chloride, Dried Chicory Root, Taurine, Zinc Amino Acid Complex, Hydrolyzed Yeast, Vitamin E Supplement, Iron Amino Acid Complex, Manganese Amino Acid Complex, Ferrous Sulfate, Zinc Sulfate, Selenium Yeast, L-Carnitine, Vitamin A Supplement, Vitamin D Supplement, Copper sulfate, Vitamin B-12 Supplement, Niacin Supplement, D-Calcium Pantothenate, Thiamine Mononitrate, Biotin, Magnesium Amino Acid Chelate, Riboflavin Supplement, Calcium Iodate, Pyridoxine Hydrochloride, Lecithin, Fructooligosaccharide, Folic Acid, Dried Enterococcus Faecium Fermentation Product, Dried Lactobacillus Acidophilus Fermentation Product, Dried Aspergillus Niger Fermentation Product, Dried Bacillus Subtilis Fermentation Product, Yucca Schidigera Extract, Citric Acid, Rosemary Extract. The average dog food we reviewed has 39 total ingredients, with 1 controversial ingredient. This product has 0 controversial ingredients. That’s what you want to see, great! Victor Multi-Pro Dry Dog Food does not have a single controversial ingredient. This dog food is made in the United States. That’s excellent because regulations and quality standards for dog food manufacturing are quite high in the U.S. The meats and added fats in this product are clearly named, showing you which animals they come from: Beef Meal, Chicken Fat (preserved with mixed Tocopherols), Pork Meal, Chicken Meal. Victor Multi-Pro Dry Dog Food contains 0 controversial artificial preservatives. It’s good to know that ‍not all artificial preservatives are bad. That’s because they serve an important purpose, which is to prevent food from spoiling. However, we consider 11 artificial preservatives controversial because of their potential link to cancer and other serious health conditions. Last but not least, this product manages to shine by also not using any artificial flavors. No artificial preservatives, colors or flavors is exactly what you want to look for in dog food. Victor has a below-average number of food recalls. Victor responded very quickly, within one day. Even better, they provided complete answers. Very few companies had customer service departments operating at this level. We have a large team of brains that gather together to formulate our kibble, however, one of our leads would the Vice President of Regulatory Affairs and Quality is one of the leading food safety experts in the country. 1.) Victor Super Premium Pet Food has not historically performed AAFCO Feeding Trials on our pet foods. This was a decision made based upon the perceived quality of the AAFCO trials and the lack of data garnered from them. While the AAFCO Official Publication lists out all of the requirements for an AAFCO trial, we have concerns about the quality of data generated by feeding a minimum of 8 dogs, fed 26 weeks on a product, and having approval based upon loose measurements such as: "No individual dog may lose more than 15% of its initial body weight (or 10% average across the group), and up to 25% of the dogs starting the test trial may be removed for non-nutritional reasons or poor food intake." To interpret this, if 25% of the dogs won't eat the food, they can be removed from the feeding trial and not calculated in the final results. Most scientific trials require a control group, and a methodical approach to determining the answer you are looking for. Saying all that, due to social media and the influx of people asking for AFFCO trials due to the TD Cardiomyopathy Facebook group / UC Davis information, etc. ; we are planning to start AAFCO trials later in 2019 on Victor products. This will simply allow us to say "yes we have AAFCO approved feeding trials on file", when people ask. 2.) Victor Super Premium Pet Food is based upon true scientific research, with some of that research being peer-reviewed, university research. Not all of our research is published, as a lot of it is held confidential internally. We do perform some simple local feeding trials (palatability, preference testing, etc), but then go above and beyond to obtain the research needed to make well educated decisions for our formulations. In addition, we select many of our ingredients based upon their peer-reviewed, published research such as the Zinpro Performance Minerals, the Alltech additives, or the Diamond V XP yeast. Many in the scientific community see greater value in this type of research than they do in AAFCO feeding trials"
This was an exceptionally complete and honest answer compared to all other manufacturers. All of our products are made and manufactured right here in the US. While we are located right here in small town Mount Pleasant, TX, our facility is not built for tours, nor safe for visitors. Our number one priority is food safety. Each ingredient is tested before it ever enters the system, to make sure it meets our high standards of quality. Our food is formulated with AAFCO correspondence and resources. All of our formulas are based on AFFCO Nutrient profiles and go above and beyond AAFCO guidelines. We test each run of food for consistency with our targets, and compliance with the states that we sell in. VICTOR essentially is its own manufacturing facility. Mid America Pet Food is the parent company, however, VICTOR is their brand and we produce it in house. All of our ingredients are sourced here in the US by trusted suppliers.